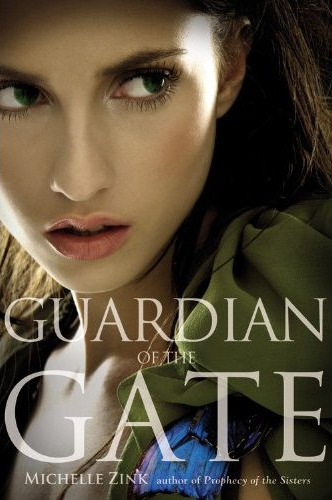 Finally, I got my hands on a copy of Michelle Zink's Guardian of the Gate, the sequal to her debut novel, Prophecy of the Sisters. I don't know how I ever managed to wait so long before continuing this awesome YA trilogy! Eight months after Lia left for London, she and Sonia wait for the keys to be found in order to end the prophecy. But, it seems now that as the search for the keys continues, they must travel to find the missing pages of the prophecy in order to learn how to end it forever. Though they do not travel alone, they must keep watch for the Souls trying to get to Lia in order to get her to aid their opposing side in the prophecy. All the while, Lia's twin sister, Alice, is also a threat to Lia's side. As she grows even stronger, Alice is now intervening with the life Lia left behind in New York; the life that involved James. Lia and Alice may be sisters, but more than anything, they are enemies. This tale of rival twins is a dark and adventurous one! As it was with Prophecy of the Sisters the mood is just right. It may be creepy, but it's far from low-spirited. Perhaps this balance is even more evident in Guardian of the Gate because there's so much traveling involved, which helps to build anticipation as one reads. Though the characters often travel, their voyages do not get particularly monotonous as some journies can be. It was all quite eventful with plenty of surprises. One of those surprises is Dimitri. At first, we get a glimpse of his character, but then BAM - he's important. When I say it like this, I don't mean that the pace wasn't even or anything negative. I was just surprised to see this character really come forth. Well, maybe I did expect that... I guess I just didn't expect to like him so much. When it comes to YA series' anymore, I always expect a new love interest that I don't like as much to be introduced in the second book. Dimitri didn't follow that typical standard. Sure, he's a new love interest. But he's likeable and seems smart thus far. Even in terms of plot, not much is predictable. Also, I enjoyed reading about Luisa. If I ever laughed during this book, it was because of her. Oppositely, some of the grumpy women on Altus really annoyed me. Especially Ursula. Anyway, I felt for Lia whenever she had to have awkward conversations with these snooty people, no matter how beautiful of a place Altus may be. I really hope that these cranky women don't get in Lia's way or add to her current level of stress in the next book. Unfortunately, we don't get to see much of Lia's sinister sibling, Alice. This happens due to all of the traveling Lia must do in Guardian of the Gate, bringing her away from her power-crazed sister. Let's face it, Alice is kind of creepy, but that makes her interesting to read about. And obviously, you kind of need her in order to enforce the whole twin enemies concept. This concept is still enforced though her lack of presence made it less potent. But as with the first book, the general plot and the writing of Guardian of the Gate captured my attention more than any of the other elements, especially now that there are more twists in this stupendous sequal. Although our poor protagonist, Lia, has to deal with all of these new twists, she seems to deal with it all quite well, but not unreasonably. At times she is exhausted and constantly dwells on even the more minute problems, but she's one of the smarter protagonists of YA. She thinks. I must admit that I adore this trilogy! Reading both books have been such fun! I refuse to wait around too long before finally buying Circle of Fire, the final book of Lia's story. With the first two novels being more than exceptional, I'm sure that I won't be disappointed.